Just how much did Sachin mean to us? The aspiration for success is the single most natural thing in the world. It is not a trait unique to human beings alone; it is the very fundament upon which nature exists. It is what gives rise to evolution and results in life as we know it. And yet there are times, even before you begin, you not just suspect that you will not succeed, but know that you are doomed to, and, will fail. Nonetheless, you go ahead and do it anyway. Because it is not a choice, but a call to duty; like a mountaineer attempting to scale that one last impossible peak, a surgeon trying to perform the miracle that will not happen or even a letter of infatuation that you know will never be reciprocated. Failure is merely a meaningless byproduct. And so I attempt to put in words, the emotion that cannot be explained but can only be felt, the phenomenon that cannot be understood but can only be experienced and a love that cannot be rationalized but can only be succumbed and surrendered to. I attempt to both understand and explain how much Sachin Tendulkar has meant to Cricket fans across the world, how much he has meant to millions of Indians and, how much he has meant to me. But I fail. 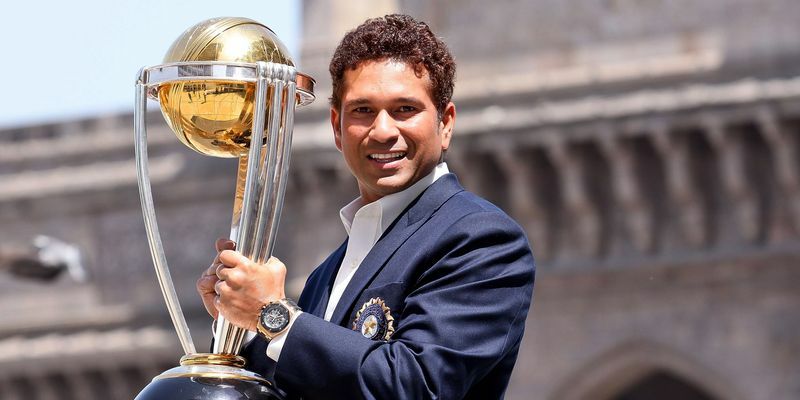 But that is alright; it will not be a reflection of the inadequacy of my writing but rather a testament to the magnitude of the Tendulkar phenomenon, the Tendulkar experience, and the Tendulkar emotion. It was in the 9th grade when I first realized that hyperbole can literally be true; a spectacular fall from a bicycle resulting in me actually seeing stars. And then it happened again a couple of years later. It was the evening of November 5th, 2009, at the Rajiv Gandhi Stadium, Uppal, Hyderabad. It was ‘that’ match, where chasing 350 against Australia, Tendulkar scored 175 of the most glorious runs, and still, India lost by three runs. Having had faced 16 balls for just 6 runs, Tendulkar clips Hilfenhaus to deep square leg and scampers three. It would have been innocuous if not for the fact that with those three runs, he became the first batsman to score 17000 ODI runs. The crowd, to the last man, are on their feet. They shout and they scream; they clap and they stomp. And all because of that one small man hitting a ball with a bat. This was fan-dom and this was fanaticism but this was also something more, something perhaps purer and something certainly rarer. This was about millions uniting in joy. This was not the crowd celebrating Tendulkar’s achievements but celebrating their own because, for that brief moment in time, Tendulkar was a part of them and they were a part of Tendulkar. This was fan-dom and this was fanaticism but this was also something more, something perhaps purer and something certainly rarer. This was about millions uniting in joy. This was not the crowd celebrating Tendulkar’s achievements but celebrating their own because, for that brief moment in time, Tendulkar was a part of them and they were a part of Tendulkar. Tendulkar meant so much to so many people for so long a time. Tendulkar was a great batsman; probably one of the best that there ever was and record books will confirm that. But if he was only that, he would have been confined to the world of Cricket; instead, he ended up being a cultural phenomenon. How did this remarkable journey come about to be? Where did it all start? While most of us spend a lifetime searching for our true calling. Tendulkar found his at the age of 10. By the age of 14, he was known as the ‘Greatest Schoolboy Cricketer ever’. And then, less than two years later, in a room in Bombay, five wise men were having a heated discussion. It was absurd. Tendulkar was only 16, and he looked 14. Some of the selectors argued that Pakistan with its fearsome bowling attack and the hostile environment was no place for a kid to be making his international debut. They would have been right except for the fact that they were discussing Sachin Tendulkar. One of the five, Naren Tamhane, thoroughly exasperated, got up and shouted, “Tendulkar never fails’. And so by the age of 16, the hopes of a nation rested on Tendulkar. The selectors were not wrong to be wary though. In that first series, against that fearsome attack, amidst the hostile Pakistani crowd Tendulkar almost failed. Waqar Younis broke his nose and drew blood, but heroically, Tendulkar batted on, his spirit unbroken. As the years passed by, the runs accumulated and the centuries began to pile up. There were some memorable innings, a few glorious victories, and some inevitable heartbreaks. But more importantly, he began to become one of us. Fathers bonded with their sons over Tendulkar. The generation gap was briefly erased while discussing Tendulkar with our grandparents. And for as long as Tendulkar batted, our mothers would relent and let us watch television. Once he got out though, television sets were turned off and reality resumed. Tendulkar had firmly become a part of our collective psyche. All nations need a hero and Tendulkar was ours. There are two kinds of heroes though. The first kind are those who do the unexpected. When David defeated Goliath, he was a hero because he performed a miracle. The other kind though, the rarer breed, are those who do what is expected of them, over and over again, without fail. Tendulkar did it for nearly a quarter of a century. In fact, Tendulkar had begun to become so much a part of our lives that the nation’s mood began to depend on his performance. It was a vicarious relationship. We lived out our dreams through his achievements. We celebrated his success and mourned his failure. We prayed when he was injured and swore when he was wronged. In 2007, when Tendulkar repeatedly got out in the 90’s, I spent almost all of my pocket money on replacing the three remotes that I had broken. Tendulkar did not make our troubles go away of course but he helped us forget them for a while and made the pain more bearable. As long as Tendulkar was batting, the world was a kinder place. Was Tendulkar aware of the hype around him? Was he aware of people worshipping him and temples being built? He certainly must have been, it was difficult to miss after all. Was he comfortable? Very unlikely. For, the relentless scrutiny, and the magnitude of pressure, that Tendulkar has had to face can and does break the best of men. And yet, he was not broken. The expectations only seemed to fuel his hunger for runs and the love and affection showered upon him only served to make him ever more humble and grateful. Circumstances conspired to make Tendulkar the phenomenon that he became. Tendulkar’s immense ability, prodigious talent, and audacious stroke play certainly contributed. But more that, it was the television revolution sweeping across India, and the coming together of Cricket and commerce for the first time that made the Tendulkar phenomenon happen. What is remarkable though is that Tendulkar did nothing to halt the procession of that incredible phenomenon. He became the great batsman we expected him to be. But more than that, he was a role-model like we demanded him to be. For all of Tendulkar’s staggering achievements, his greatest achievement is not in what he has done but in what he hasn’t. He didn’t rebel, didn’t try to run away, and didn’t try to shrug off the stifling expectations of perfection placed upon him. He didn’t throw tantrums, he didn’t have affairs and even didn’t court scandals. In our society, like in most others, we place people on high pedestals, often only for the sadistic pleasure of seeing them fall. Higher the pedestal, greater the fall. Tendulkar though didn’t give us that opportunity. Instead, he became what we wanted him to become- honest, hardworking and humble. And he remained that way. For 24 glorious years. Somewhere along the way, for some of us, this hero worship transformed into just worship. Cricket became our religion and Tendulkar our God. Like so many other kids around the world, my room walls were plastered with posters of my heroes. Thanks to SportStar, there was Tiger Woods, there was Federer essaying one of his glorious backhands, Beckham oozing glamour, Schumacher in his blood red Ferrari but most of all there were the Cricketers- Lara, Dravid, Sehwag, Hayden and others. One face missing on the walls though was that of Sachin Tendulkar. Because the roof was reserved for Sachin. Every Sunday morning, I would take the week’s newspapers and magazines and cut out the pictures of Tendulkar most carefully. Then I would get onto the bunk bed in my room and perform acrobatics as my sister passed on the sellotape. My mother did not approve much of what she considered the desecration of the walls and the roof, but she understood. It just seemed right somehow; looking up to Tendulkar first thing in the morning. That was my daily dose of prayer. And so I end by trying to answer the question I had asked at the beginning. Just how much did Tendulkar mean to us? It was that same ‘175’ match against Australia. The sun was setting and the stadium was bathed in warm orange. The flood lights had just been switched on and the outfield dazzled a pristine green. Hyderabad rarely looked better and it was a glorious evening to watch Cricket. And just then, a great flock of birds glided past the stadium. It was a spectacular sight. The spirit of each spectator there was stirred. All of those 50,000 or so were excited. And how do they express this excitement and euphoria? They break out into a chant of "SaachinSaachin", when Tendulkar wasn’t even batting. That’s how much he meant to us. In our country, we call our friends by their first names. But we refer to our heroes by their family names. So it is Gandhi and not Mohandas, Bachchan and not Amitabh, Dravid and not Rahul. But he was one of us. And so more than Tendulkar, it was always Sachin. That’s how much he meant to us. As I stood in Wankhede, listening to Sachin give his farewell speech, tears streamed down my face. Except I wasn’t alone. All around me, grown men were weeping and sobbing openly. That’s how much he meant to us. And just yesterday, I decided to watch Tendulkar’s movie alone, as I thought the emotion was too personal a one to be shared. But I was wrong. I wasn’t alone and U couldn’t be alone. We were strangers but were together, probably for one last time, we reignited the passion, rekindled the memories and relived the journey. The theatre transformed into a stadium, with chants of Saachin, Saachin. And that’s how much he meant to us. Sambit Bal, the editor-in-chief at ESPN Cricinfo said it best. "Tendulkar loved Cricket more than anything else and Cricket loved back Tendulkar more than anyone else." Chartered Accountant, IIM-C Student; well that was the unimportant part. Sports fan; Cricket Fanatic; Tendulkar Devotee. Being there at Wankhede, as Tendulkar bid farewell, well, that was the biggest pilgrimage of all. Love to read; Like to pretend that I can write.